The Mason, LLC welcomes you. We hope you enjoy your stay!! Check-in: 3:00 PM. You will received an email with a code for check in THE MORNING OF YOUR ARRIVAL. If arriving on a weekend day, your code will be sent out on Friday. If you do not receive your code, please contact us . We have staff on site Monday - Thursday from 9 am until 4:30 pm and Friday from 9am until noon. We are available for emergencies 24 hours via telephone. If you require special assistance with check in, you must make arrangements in advance of your arrival. The credit card you use to make your reservation will be charged in full when your access code is emailed to you. 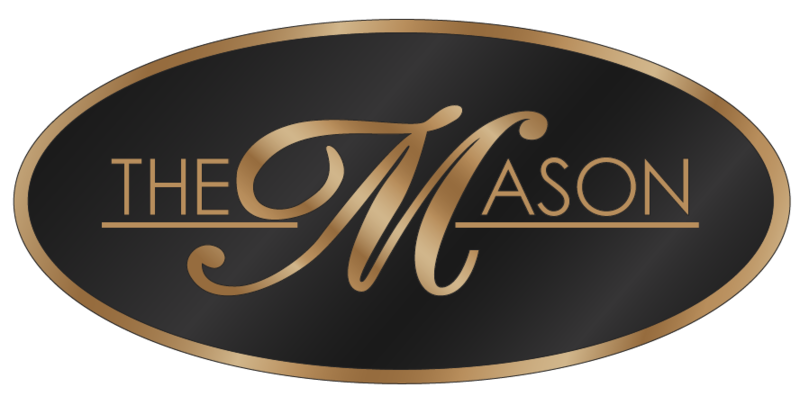 The Mason is an exclusive property where every guest reservation is both important and special to us. If your travel plans change and you must cancel your reservation, please call us at least 24 hours* prior to your arrival date to cancel your reservation. In the unlikely event that you must cancel with less than 24 hours* * notice, shorten your stay or check out early, please understand that we must ask you to take responsibility for your entire reservation. If we can book your room(s), a full or partial refund will be made. Check Out is 11:00 AM. Guest who remain after 11 AM. will be charged for an additional day. This also applies if you do not remove your items from the room by 11 am. ABSOLUTELY NO SMOKING INSIDE; however designated outdoor smoking areas are available. There will be a $500 charge if smoking is detected in your room. The credit card used to make the reservation will be charged. Absolutely no pets are allowed in the units. If a pet is found in any of our Suites, the guest will be asked to leave, and no refunds will be given. A cleaning fee will be charged to the guest of not less than $200 but may be more if more cleaning for repairs are required. WE DO ALLOW SERVICE ANIMALS; HOWEVER, WE SHOULD BE NOTIFIED PRIOR TO YOUR ARRIVAL THAT A YOU WILL BE ACCOMPANIED BY A SERVICE ANIMAL. There is a Credit Card required to hold your reservation. If you wish to cancel, please do so 1 day prior to arrival to avoid cancellation penalties. If you are a no show, or cancel less than 24 hours prior to arrival you will be charged for your reservation. We will not charge you if your room can be rented.Rates quoted are based on check-in date and length of stay. Should you choose to depart early, price is subject to change. We reserve the right to cancel or modify reservations where it appears that a customer has engaged in fraudulent or inappropriate activity or under other circumstances where it appears that the reservations contain or resulted from a mistake or error. Reservations may be cancelled if the credit card on file is not valid. Whole house bookings require a 50% deposit of your total stay. The deposit you make is refundable, less a $50 processing fee if you cancel up to 30 days before your arrival date. If you are making a whole hose booking within 14 days of your arrival date, the full amount will be due at the time of the booking. We accept all debit cards as well as Visa, MasterCard, American Express, & Discover. We DO NOT accept personal checks. We do offer direct billing for corporate accounts. Check out is at 11:00 am. We need time to prepare our rooms for the next guest. We will do our best to accommodate any request for a specific Suite, however, we cannot guarantee any particular Suite. Any personal items left behind or lost during a stay are the responsibility of the guests. We are not responsible for items left behind or lost. However, we will ship back any items that are found (if the guest request them) by a local shipping service. The shipping charge will be the responsibility of the guests. We will hold any items left behind for 30 days to see if they are claimed before disposal. Our units are inventoried after each stay for missing items. You will be charged for any damages to the property or for any items that are missing after your stay. If there is a need for excessive cleaning upon your departure, you will be charged an additional cleaning fee of not less than $50 per room or suite depending upon the nature of the mess and/or damage. Any theft, vandalism or evidence of drug use will be photographed and reported to the police and followed by litigation. Any Suite that is left unsecured by the guest, resulting in times being damages or stolen, will be the responsibility of the registered guests. He/she will incur the cost of replacing any items which are damaged or stolen. Please keep in mind that there are neighbors. Keep the noise levels to a minimum. Towels and/or linens should not be used to remove make up or clean shoes, etc. You will be charged for any items which are stained and cannot be cleaned. Any guest that we are forced to evict will forfeit all monies paid and no credits will be issued. A "no-show" is an automatic forfeiture of charges — this is a contract between you (the guests) and The Mason, LLC. You will be charged the full stay if the proper cancellation policy is not followed. Absolutely no PARTIES or unsupervised minors are allowed. We reserve the right to refuse service to anyone, at our discretion. Young people must be accompanied by a parent or legal guardian. WE DO NOT RENT TO ANYONE UNDER 21. If a party is discovered to be taking place in any of our Suites, the entire group will be asked to leave. No refunds of any kind will be given. If a guest DOES have a party of which we are made aware, that guest will be charged for ANY and ALL damages and the same will be reported to the local police department. Maximum of 4 adults per Suite. Maximum of 4 adults per double room. Maximum of 2 adults per king room. We do not charge extra for children, but you must accurately report the number of persons staying in the unit. Please adhere to these maximums. If you misrepresent the number of guests in your group, you will be asked to leave, and no refunds will be given. For The Mason North, The Mason on Moody, and The Mason on Coca Cola, we clean each Suite after each stay — weekly for extended stays. We DO NOT come in daily and clean. If you need additional towels, linens, or other supplies, just leave a message for us at the office (459-4663) and we will have them brought to your Suite. If it is after hours, we will bring them the following day. For The Mason Downtown, we do make beds and change out towels daily. We change lines every third day. You should put the sign on the door daily if you do not want service in your room. If you have the DO NOT disturb sign on your door, YOUR ROOM WILL NOT BE SERVICED that day. Our rooms and suites DO NOT have telephones in them. We do not offer this amenity as we found that the overwhelming majority of our guest did not use the phones in the rooms. This allows us to keep the room rates as low as possible. The Mason, LLC reserves the right to refuse to rent to any guest at any time. We reserve the right to cancel any reservation at any time. The Guest assumes all risk when using the Fitness Room of the facility. Guests should consult with a physician before beginning any exercise program. The Mason, LLC, is not responsible for any accidents or injuries resulting from use of the Fitness Room. The Guest assumes all risk when using the WASHER AND DRYER of the facility. Guest should check the washer and dryer BEFORE use to ensure there is nothing present that would cause harm to their clothing. The Mason, LLC is NOT RESPONSIBLE FOR ANY LOST OR DAMAGED CLOTHING. Neither the Mason, LLC or its owners will be responsible for accidents or injury to guest or for lost money or valuables of any kind. The registered guest assumes full responsibility for any and all damages that his/her group causes, excessive cleaning charges for problems caused by his/her group and for any items found to be missing after his/her group's visit including linens and towels. By accepting this reservation, it is agreed that all guest of the registered renter are expressly assuming the risk of any harm arising from their use of the premises or others whom they invite to use the premises.